Win A Day Casino Releases New Enchanted Slot Game. Online Casino News. Play New Enchanted Gems Slot Machine At Win A Day Online Casino. Win A Day Casino's new game Enchanted Gems is a mystical visual fantasy online slot machine game with magical gems that trigger free spins and activate bonus feature games that bring the luxury and elegance of rare and precious stones to every player's home. It's a 5 reel and 25 payline video slot with 3 charming bonuses: the Wild bonus, the Free Spins award and Pick the Bloom bonus game. The game is available for instant play on the Win A Day casino website. The casino game is beautifully adorned with elegant diamond studded horse shoes, shamrocks, royalty crowns and gold bar symbols, which magnificently enhance the precious gems theme. Every inch of this eye catching slot is covered in some of the most sought after jewels; diamonds, gold and platinum. 5 stunning diamond encrusted dollar symbols win the Win A Day Casino's progressive jackpot which is currently over $153,000. 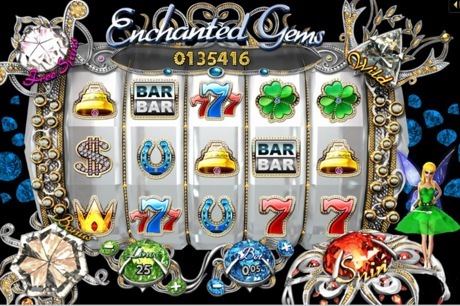 In the main game, players collect enchanted gems that trigger multiple free spins or activate a special bonus round. Collecting 5 purple gems wins 5 free spins. Seven Orange Gem scatter symbols starts the Pick Me bonus game where standard symbols are replaced by blooms which, when uncovered, multiply the last total bet. Players get to pick seven different blooms and each bloom can multiply the last total bet up to a fantastic 2,000 coins top prize. 3 Yellow Gem scatters activate the Wild Bonus round. After each of the next 3 spins, an animated Fairy flies across the reels, increasing chances of winning by casting a spell that changes a random symbol into a wild. Win A Day Casino is a no download casino with 28 one-of-a-kind online casino games that aren't available at any other online casino. Win A Day is known around the world for its friendly and efficient customer service and great browser and PC compartibility. Visit Win A Day casino now and try the latest addition yourself - you can claim 200% sign up bonus to play for real money or try it for free.